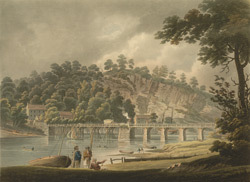 William Coxe, a clergyman who visited Chepstow in c.1801, noted that the bridge across the River Wye is of a similar type to that of Caerleon, with the floor of the bridge supported by pillars. On the Monmouthshire side of the bridge, the pillars were of stone, on the Gloucestershire side of the bridge they kept their original wooden piers. He also thought the construction of the bridge was 'extremely ingenious', the piers were constructed so only a narrow surface area came into contact with the river, which had strong currents and could swell enormously at high tide.